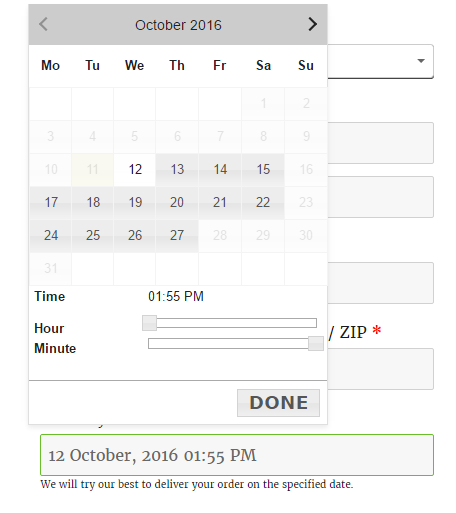 In this post, we will discuss how you can change Delivery Date calendar on the Checkout Page in Order Delivery Date Pro for WooCommerce plugin. You can change the calendar language, date format, time format and much more options. All the options are explained in this post. You can setup this under Order Delivery Date -> General Settings -> Appearance -> Calendar Appearance. The plugin provides 64 different languages from which you can set the language as per your store’s language. The default language selected for the calendar is English UK. Sometimes, the customers want that the language of the delivery date calendar on the checkout page should match the language of the website. For example, you deliver your products in France and French is the language which is majorly used in France. So you want that the calendar should appear in the french language. 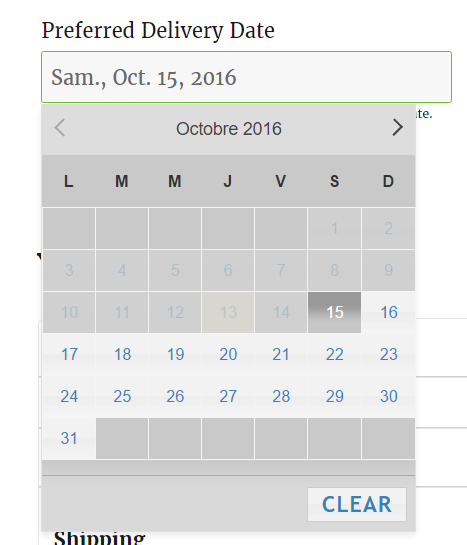 You can select the french language in the Calendar Language dropdown. 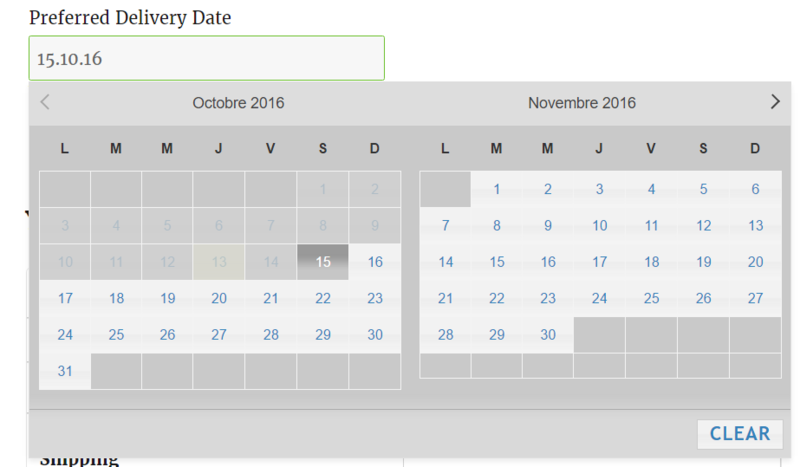 This is how the delivery date calendar will appear on the checkout page with the French language. Different countries around the world use different date formats. For example, France country uses dd-mm-yyyy, Germany uses dd.mm.yyyy format. Some of the countries also use date formats with the month names like d MM, yy. Here d refers to the date, m refers to the month and y refers to the year. The default date format from the plugin is d MM, yy which will be like 12 October, 2016. And you can set the necessary date format as per your country. The selected date from the calendar will appear in the format set. 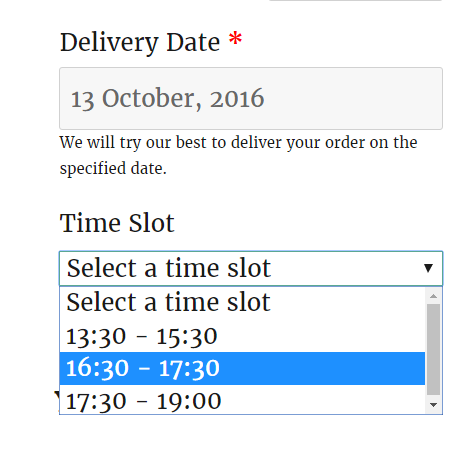 So, in the above example, the selected date format is 12.10.16. And this is how the date will appear on the checkout page. Same as the Date Format, different countries uses different Time format to display the selected time. There are two time formats, 12 Hour and 24 Hour and you can use them as per the country in which your store locates. The default time format set from the plugin is 24 Hours. 12 Hour format will display the time in the AM/PM format with 1 to 12 in sequential order, whereas the 24 Hour format uses the full 24 hours. The time format option will work both on the Time sliders with the preferred range as well as on the time slots set. 12 Hour format will appear as below on the checkout page with the time range. This will work same for the Time slots. 24 Hour format will appear as below for the time slot on the checkout page. Same will work with the Time range too. First Day of Week means the weekday on which you want the Delivery Date calendar to start with. For example, you want that the calendar should start on Sunday on the checkout page, then you can select Sunday as the First Day of Week, if you want to start the calendar from Monday then you can select Monday as the First Day of Week. If you select Sunday as the first day of the week so your calendar will start on Sunday. By default, only one month is shown in the Delivery Date calendar on the checkout page. But, some of the customers want to display the available dates for delivery for next 2 months, so their customers can check if the delivery date on which they want delivery is available or not at a glance. So you can set the Number of Months to 2 in the option. 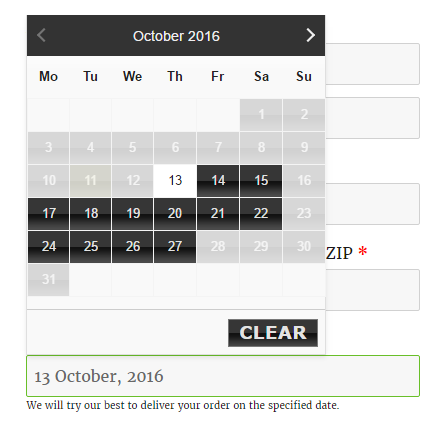 This is how the Delivery Date calendar appears on the checkout page with 2 months. 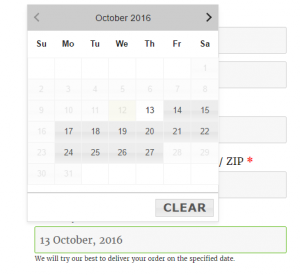 Sometimes, the customers ask if there are any themes provided for the Delivery Date calendar which can match the theme they are using on your website. The plugin provides 24 different themes, from which you can choose the theme which matches your store theme. In most of the cases, you will find one the theme which will match. 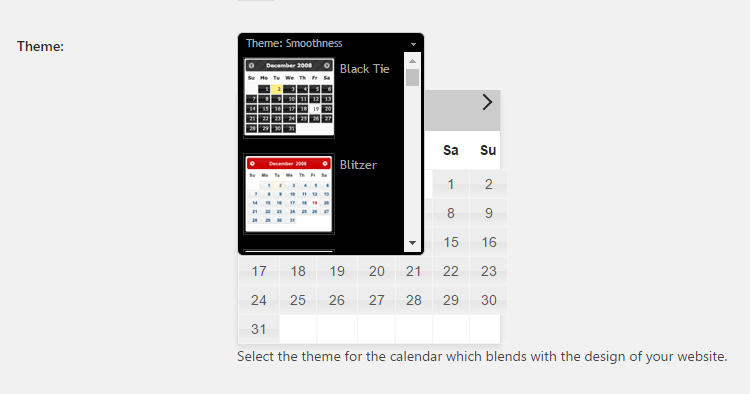 The selected calendar theme will appear like this on the checkout page. You can change the field appearance for the delivery date field. We will be discussing that in our future posts.